Relaxation, exercise, family fun, and the promise of healthy food. Does this sound like a dream vacation at an expensive resort? It might, but this description also fits backyard gardening. Gardening provides a flexibility improving total-body workout, and if you plant fruits and vegetables, delicious and healthy meals along the way. At Hinterland Chiropractic we encourage our patients to stretch and exercise, and gardening can be a great way to accomplish this. As good for you as gardening can be, chiropractors note that gardening is a common source of back and neck pain during the growing season. So, in this post we are going to go over the benefits of gardening and how to garden safely. Exercise. Just 150 minutes of moderate-intensity aerobic activity weekly can have a big positive effect on our lives. Unlike many everyday activities that only exercise our arms, gardening uses the whole body as we move around digging, planting, weeding, and watering. Gardening can be a stepping stone to better health. Good Nutrition. Growing our own food can improve our diet. We can choose organic fertilizers and natural pesticides. We can also harvest our foods at their absolute best, full of nutrients that might otherwise be lost when foods are picked unripe for easier shipping. Relaxation. Gardening can substantially reduce stress. In one experiment, researchers compared outdoor gardening to indoor reading for stress relief. Gardening won by significantly reducing cortisol levels and improving mood. Keep Your Mind Sharp. According to one researcher, nature is “an effective and affordable way” to help prevent mental disorders. 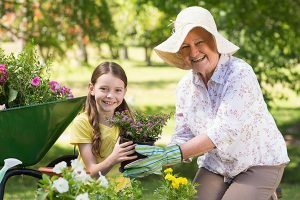 Several studies have examined the effects of gardening on dementia patients and the elderly, finding results that are generally positive and include better sleep patterns, well-being, and functioning. Students who participate in school gardening score significantly higher on standardized science achievement tests. Gardening might also help with attention deficit hyperactivity disorder (ADHD). Wear a hat, gloves, and sturdy shoes. Hydrate yourself with a bottle of water kept nearby. Get a checkup. Gardening is a physical endeavour and you need to be in your best possible shape to garden effectively. A good first step is to visit your Hinterland Chiropractic doctor for a quick checkup including orthopaedic tests, bi-lateral weight scale analysis, postural analysis, reflexes, range of motion, and thermography. If your doctor finds anything amiss, a quick and gentle chiropractic adjustment will help. An adjustment applies force in a specific direction to a joint that is subluxated, “locked up”, or not moving properly. This adds motion to the joint, helping the bones gradually return to a more normal position and motion. This improves spinal function, nervous system function, and health – you will be ready to garden! Warm up. Like any other physical activity, gardening requires preparing your body for new movements. So, before gardening, be sure to practice some stretching. If you have questions about what to do, consult with Hinterland Chiropractic. Take breaks. It’s smarter to pace yourself instead of powering through to get the job done. Set a timer and take a break every 15-20 minutes to stand up, stretch and walk around a bit. Breathe. While you’re stretching and hydrating, take in some deep, oxygenating breaths to nourish your hard-working muscles and help to improve circulation. Listen to your body. Be careful not to get so wrapped up in your gardening that you ignore aches and pains. Pay attention to the messages your body is sending you. If you feel a twinge, take a break or change positions. If you have a twinge or pain that lingers, see your doctor at Hinterland Chiropractic! Don’t overdo it. Divide large loads of gardening materials into smaller batches that are easier to handle. If you must lift something heavy, consider asking for help, or following safe lifting practices. If you are a gardener, or plan to begin gardening, you are taking a great first step towards a healthier lifestyle. To make sure you are in tip-top gardening shape, visit your trusted Gold Coast chiropractors at Hinterland Chiropractic today!